Up, walked Mix and breakfasted in the farmhouse. When Tom arrived we completed the roof of the Bothy while David continued to work on providing services for the Stables. In the afternoon Tom and I went to Pearsons and bought the roofing felt for the Bothy and then helped David install equipment by building a wooden frame in the Stables. Tom also rounded off the eaves of the Bothy – we really are ready now to start putting on the felt – but the weather forecast is dreadful so it may be a day or two until we are able to start. 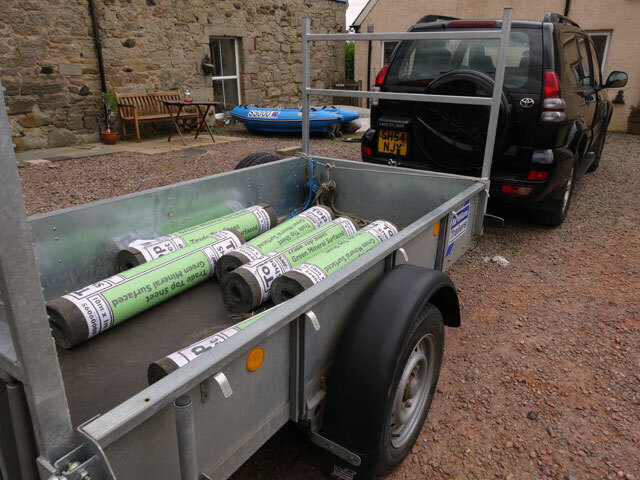 Olive, Digger and their friends went off to Eyemouth, to Berwick, to Spittal and to Coldstream. Mum and Rachel went into Duns where Mum had her hair done. In the evening we all dined at the farmhouse and later I watched a bit of the referendum debate between Alastair Darling and Alec Salmond. I thought that it was a pretty unsatisfactory debate for both sides, really because neither listened to the other. I also thought that it was pretty shoddy that the debate was only available to us in the Scottish Borders on the internet. In the wider world I was impressed by Baroness Warsi deciding that enough was enough and resigning from the Government over events in Gaza and the failure of the British Government to speak out about it in the way that she thought appropriate. I was also taken aback by the German court’s decision to halt proceedings against Bernie Ecclestone for alleged bribery when he agreed to pay the court sixty million pounds to drop the case. There is something in all of this which seems rather odd. Finally it is good that a cease-fire seems to be holding between Israel and Hamas.